Cost: Attendance is free but booking is essential as capacity is limited. Come along to the launch of the Wildlife Identification Network (WIN), a WIN is a training and support network for aspiring ecologists and naturalists. This event will be a chance to learn or hone your moth identification skills and learn about the relationship between bats and moths. You will learn how to trap moths using different methods be introduced to using bat detectors. Expert guidance will be provided by Gloucestershire Wildlife Trust, Stroud Valleys Project and Gloucestershire Naturalists’ Society. We will also be roasting marshmallows and tea/coffee will be available. Booking is essential as we are expecting this to be a popular event. Please note that children must be accompanied by an adult. Get some great exercise and then have a pint afterwards in this friendly and fun walk around some of our best sites. We will start by hearing from Stroud Valleys Community Car Club, and then we will walk to the Museum in the Park where we will hear about the Museum’s partnership work with Stroud Valleys Project. We will then walk through town to Capel’s Mill. We will hear from Fred Miller, our project officer who has worked with volunteers to plant 500 trees and 1000 native snowdrop bulbs. Finally, we will visit Arundel Mill Pond, which is a site owned and managed by Stroud Valleys Project before finishing at Stroud Brewery. Everyone who finishes the walk will get a free pint (or soft drink). Unfortunately this event is not wheelchair friendly as there will be some steps down to the canal. Please note we will also be crossing some main roads where there is likely to be traffic. Please wear sensible walking shoes and bring outdoor clothes in case it rains. You should also bring a bottle of water to keep you hydrated. Please ensure you arrange a lift home from the brewery. There will be a few spaces in the SVCC car to go back to Stratford Park if desired; please let us know if you need this. To guarantee a place or for more information please telephone Stroud Valleys Project on 01453 753358. 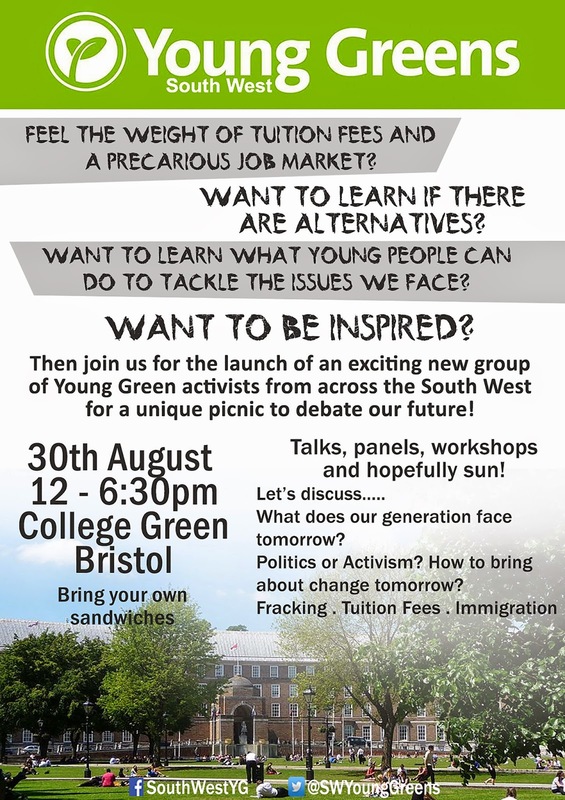 The newly formed SW Regional Young Greens group will be launching with a fantastic outdoor event on Saturday 30th August in Bristol (see poster at top of page). If you are on Facebook, please do check out our event.